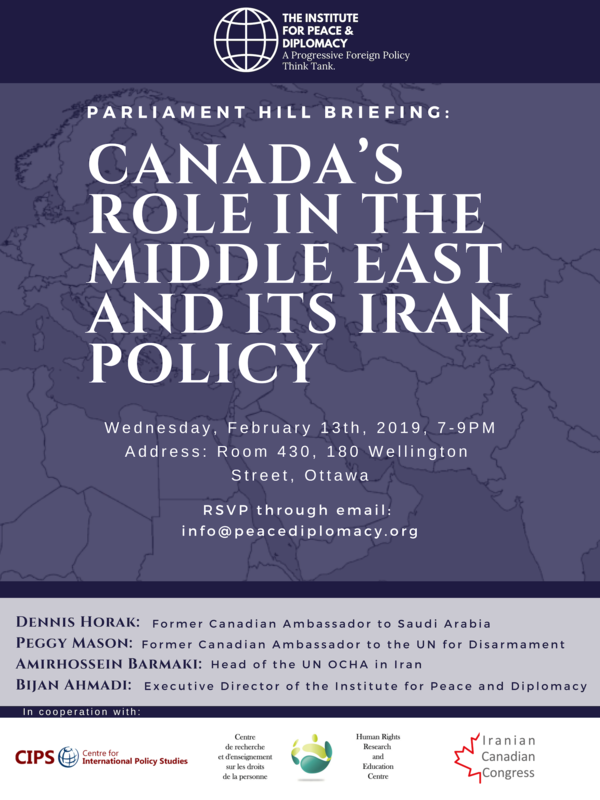 This event is organized by The Institute for Peace & Diplomacy in cooperation with the Human Rights Research and Education Centre, the Centre for International Policy Studies and the Iranian Canadian Congress. This event is by invitation only and RSVP is required by end of Monday Feb 10, 2019. Please RSVP by sending an email with your contact information to info@peacediplomacy.org. Note that building security will ask you for a valid ID to enter the building. For faculty and students at the University of Ottawa we kindly ask that you RSVP using your official university email address. About the Institute for Peace & Diplomacy: The Institute for Peace & Diplomacy (IPD) is a Canadian non-profit and non-partisan foreign policy think-tank dedicated to promoting peace, diplomacy and dialogue. For more info visit: PeaceDiplomacy.org.